The (in)famous Galaxy News Network (GNN) combat news team of ace reporter Brun Hilda, hiding from vengeful FSE Legionnaires after filming the FSE troops commiting atrocities. Hello and welcome to stargrunt.ca. 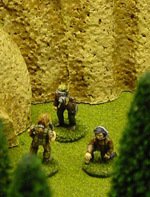 This website provides a venue for fans of the table-top miniatures wargames produced by Ground Zero Games. These include Stargrunt II, a game of platoon-level infantry combat suitable for 15mm to 25mm miniatures; Full Thrust, a game of starship combat; and Dirtside, a game of battalion-level mechanized warfare intended for 1/285, 1/300, and 6mm miniatures. While all of these games are primarily intended for science-fiction settings, Ground Zero Games wrote them to be genre-neutral. You can use the setting provided by GZG, but you are not required to. Nor are you required to play with their miniatures - you are encouraged to use any miniatures you like. The rules are excellent as rules, and can be applied with very little modification to just about any modern or future setting. House Rules - Alternative and additional rules for game mechanics and general weapon/equipment effects. Tables of Organization and Equipment - Details of forces not included in the rulebooks. Vehicles and Equipment - Vehicle designs and specific new equipment/weapons not included in the rulebooks. Scenarios and Action Reports - Game scenarios/mission ideas and, where possible, After Action Reports detailing how each scenario played out in a real game session. Settings and Histories - Alternative settings and histories to try out or read for fun. New powers and/or further details of existing powers mentioned in the "official" GZG universe. Links - Links to other websites useful for fans of GZG games and the general wargaming hobby. Reference Information - Articles with information that might be useful to players and fans of the GZG games. A glossary, FAQs, etc. Articles of Interest - Where we stick anything that we think is interesting, but that does not fit anywhere else, including fiction. Gallery and Modeling - Gallery pictures of our collections. Articles on modeling ideas and techniques. Contact and Submissions - How to get in contact with us, and policies/guidelines for submitting articles to stargrunt.ca. March 20, 2006 A new Photo Gallery has been included. Ground Zero Games is releasing a new line of 15mm Sci-Fi military vehicles. We have some pictures of pre-production castings, supplied by Jon Tuffley at GZG.